Another one of our insightful marketing articles was published recently in the Upstate Business Journal. In this article, we discuss the importance of being known to your buying market and how to become the preferred choice among the options they may have before them. Bridging the gap between your offering and your buying market requires having the right tools to effectively communicate your solutions. With the right mix and balance of marketing tools, you will be prepared to address who buys from you, why, when, where and how often. There are also 10 points we discuss that are important considerations while developing and building your marketing toolkit. Occupying your buyer's sweet spot is where you want to be because that's where buying decisions are made. Commit to the process of getting there...and remaining the preferred choice. In the end, your marketing efforts will be more effective which will lead to increased revenue-generating potential for your business. Click here for the entire article: Owning the Sweet Spot. Feel free to share this on your favorite social media sites and email it to a colleague or friend. The concept of outsourcing isn’t new, but the trend continues to gain momentum. From a marketing perspective, it means gaining the professionalism, expertise and deep experience of a marketing resource versus hiring someone and carrying them on your payroll. As a result, having this kind of resource can provide you with a quick ramp-up to implementing marketing initiatives centered on business growth. Being able to tap directly into a professional marketing resource for collateral development, brand initiatives, customer communication projects, digital marketing, public relations, event coordination, website design and more is a huge advantage. It is also a less expensive option to hiring a full-time equivalent. You’ll have fee structures that bring a level of predictability through a defined scope of services. And, the arrangement is often flexible allowing you to modify the scale of services to match your business situation. Plus, your services model provides inroads to supporting marketing services that can be bundled with your monthly agreement or used to augment project work. The trend of outsourcing continues not only in popularity but in practical application. Companies that choose to outsource their marketing function are able to remain focused on their core competencies while trusting the expertise of a marketing professional to work in parallel with them. The value is there and companies will continue to pursue these advantageous opportunities. What Should be in Your Marketing Toolkit? Tools exist to help us effectively accomplish a project or task. In business, you need sales and marketing communication tools to inform your buying market about your products and services. Often this means you need to bridge the gap that exists between your offerings and the market. Information about your offerings should be conveyed to a prospect so that they have a clear understanding of your solution. This can be accomplished by developing tools such as a well-structured digital brochure, video, testimonial, printed material or a presentation. Add "more power" to these tools by including benefits-rich content for success stories, customer profiles, solution overviews, white papers, and more. In some situations you may want to customize your materials for a particular vertical market or for a specific solution. All of these are tools that can be developed by your marketing resources to properly equip your sales team. Collectively, these tools form your marketing toolkit to help you communicate with your buying market. Your marketing toolkit is purposed to enhance the sales process in order to professionally convey your solution offering to buyers. Each of your communication tools will serve a specific purpose on their own and collectively form an integrated sales and marketing toolkit designed to connect well with your market. If you haven't seen them by now, here they are: the new logo for Instagram and the refreshed logo for Aquafina. The reviews and responses to Instagram in particular have not been overly favorable. Many considered the old logo as a beloved retro camera icon while others felt the new look was necessary to create a visual more in step with today's icons. The result is an interesting new logo that combines the simplistic white outline of the iconic camera while adding a vibrant, rainbow-esque background that ironically feels a bit 70's retro. Regardless, Instagram felt it was necessary and it has certainly garnered major media attention - - which isn't a bad thing. The brand itself enjoys a huge user base following yet many in that mass have had less than kind things to say about the new mark. Like all things, time will tell and it will be interesting to see if this direction inspires other brands to follow suit...but hopefully without this psychedelic wave of colors. Aquafina, on the other hand, went the subtle route. The old logo boasted of a jagged mountain range and a serif font with the recognizable elongated letter "Q". When the in-house team at Aquafina was finished with the new logo, they revealed a toned-down mountain and a very plain font that is popular in many styles today. Simplicity is the current trend and Aquafina appears to have hit on that. Even though the roll-out of this new look was accomplished in somewhat of a stealth mode, the reaction to this new mark over the past couple of months has been positive overall. What About Your Brand Identity? Remember, your logo is only one important piece of your entire branding image. When you update your logo, be sure to evaluate other components that may need to be refreshed so that your image is consistent across all communication platforms. Recently published in the Upstate Business Journal, this article provides insights related to strategic marketing and how to map out a plan. Just as a map illustrates the best way to reach a destination, a marketing road map serves as a guide that outlines how your company will connect to the market to create revenue-generating opportunities. Your marketing road map will provide details about the proper “marketing routes” that will work best for your business. Click here for the entire article: Strategic Marketing Requires a Road Map. The business climate has experienced more conditional changes within the past few years than most people can remember. An uncertain economy, rising unemployment, a weak housing market and many other factors have contributed to these conditions. Although these remain tough times, it isn't a time to fold the tent and hide under the bed. Instead, why not buy a new mattress? While in the waiting room of a doctor's office, I noticed a couple of framed posters on the wall that caught my attention. With an emphasis on sports medicine, this particular office is well known for their expertise in treating both athletes and those who enjoy moderate sports activities. As I approached the large posters, I was immediately struck by the testimonials each one projected. The first was an image of former swimmer Amy Van Dyken. Beneath her picture, the text read "4 time Olympic Gold Medalist". However, that had been modified when Amy autographed the poster. Next to her signature, Amy had marked through the number 4 and written 6! But, here's where the eye-opener comes in - - next to that, she wrote "thanks to you". The endorsement now stated "6 time Olympic Gold Medalist - Thanks to You"; directly attributing her success to the sports medicine doctor. The second poster was one of former Major League Baseball player, Jeff Bagwell, when he played for the Houston Astros. Next to his autograph, he wrote "Thank you for helping me make it to the World Series." Wow! That's the type endorsement you just don't see every day. Your business really isn't that different from this sports medicine doctor. Granted, you may not have access to the same "star power" of a celebrity endorsement, but if you're doing a good job for your customers, surely someone will want to boast about that on your behalf. Endorsements are powerful and can be used in many ways such as your website, in newsletters, brochures, etc. All it takes is a simple quote, a comment or something similar that states your business delivers what you promise and your customer receives the expected result - maybe even more! Yep, it appears Denny's is at it again. They must be on to something that is working. A new advertisement is launching to promote another free meal for their Grand Slamwich. As they did during the Super Bowl ad, Denny's will be offering a freebie to those who bring a friend who could use a good meal. The idea is to promote 'acts of kindness'. A good idea, no doubt, and one that will continue to boost their already high brand favorability. Some may be asking why they would bother with another free offer. In marketing, there is no more powerful word than 'free'. And, it works. It's obviously working for Denny's because they wouldn't bother investing in another promotion of this type if the first had been unsuccessful. Plus, they understand the importance of consistency. The Super Bowl promo could have easily been a one-off, one-time deal that we soon forgot about. But, no, the marketing pros at Denny's recognize that and are ready to pull the trigger again. When this ad hits, there will be many consumers who recall the Super Bowl promotion and thousands upon thousands who will recall excellent service and quality food when they partook of the free Grand Slam meal back in February. This is likely to create a lot of additional buzz for Denny's. That's only part of what they're after. It is the buzz that translates into revenue dollars that will be the real measure. I'm betting they'll please a lot of hungry patrons while bringing a smile to the company's bottom line. 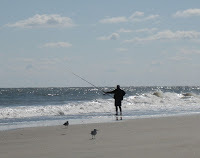 On a trip to the coast last fall, I observed a fisherman that to me appeared to know what he was doing. He arrived on the beach and proceeded to mark his spot, prepare bait and set his pole with high hopes of landing 'the big one'. I watched out of curiosity as he cast his rod then waited patiently for a bite on the end of the line. Sure enough, he had action in no time. From my vantage point and distance from him, it was difficult to see exactly what he caught, but I did witness a few 'keepers'. At the same time, there were definitely some 'throw backs'. As this scene unfolded, it reminded me of how many companies approach their marketing. The intentions are normally good, but sometimes the strategy and execution are lacking. Simply casting your marketing dollars into the blue abyss hoping for a big bite is a high risk and expensive venture. It's essentially the same as mass communication with the intention of reeling in perhaps only a select few keepers. The bait and rod may be right and even the blue waters where those prospects are looming, but tossing a 'hook' for anyone to snag probably isn't the best approach. Wouldn't you have a much better opportunity of success by identifying who you want to send your message to, tailoring it to their needs and then executing a plan that properly connects with them? Such an approach is targeted and strategic to maximize your marketing investment and efforts. Think about that the next time you're tempted to bait your hook before tossing it to the masses. In most sports, there are great analogies to marketing strategy. Successful teams go into games with a solid strategy and game plan. They don't just show up expecting the results they've mapped out on the white board prior to the game. Instead, they've considered their competition, studied how they can overcome them and devised a way to reach their ultimate goal. Proactive marketers are always on the offense - perhaps even the 'attack'. They're constantly running their game plan methodically to consistently cross the goal line. They're in control and they're getting results. Companies that take this approach with their marketing will achieve success. Consider the alternative. Suppose you choose to be reactive. Without a game plan, you're going to realize mediocre results. And, your sales team is going to be winded and on their heels worn down from battling the aggressive competition. Rarely are companies in this mode able to attain their goals and often they become frustrated at their inability to 'move the ball'. Before running out on the field (or the marketplace), consider your game plan and how you're going to implement a goal-reaching drive. When you take such an approach, your marketing and sales team will be efficient and consistently successful. I Want to Know More – Now!